Learn about Lancaster County, Pennsylvania by reading You Get Much When You Go Dutch—Lancaster County by Charlie Spence, Aviation Writer. It features a mini, but thorough tour of the destination, plus all you'll need to know to plan your trip including getting there, objective information on places to stay and eat, and things to do. At the end of the article, we've provided a summary of the contact information for your easy reference. Enjoy! 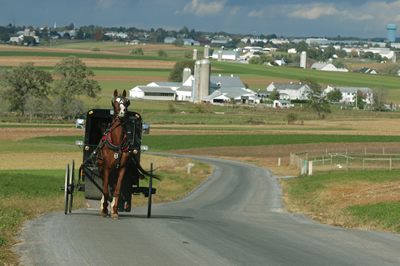 A horse and buggy travels along a Lancaster County back country road. There’s a place in Pennsylvania where two worlds meet and both get along with their styles and traditions and each holds high respect for the other with both living as they wish with little or no dissension. It’s the Pennsylvania Dutch Country and visitors are not only welcomed they are pampered, entertained, and assimilated into this wonderful world. Lancaster County has bustling businesses, charming towns, a modern airport, amusement centers, parks and everything else a bustling community should have—plus it has more than 25,000 Old Order Amish who cherish their humble, frugal lifestyle. If you are familiar with Amish life you remember the family is the most important unit with several generations sometimes living in the same household. Their dress is plain with women choosing modest solid colored dresses with full skirts, a cape and apron. Men wear dark-colored suits with no lapels, suspenders, solid-colored shirts, black socks and shoes, and broad-brim black or straw hats. 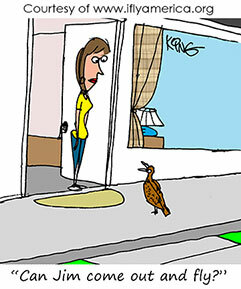 Automobiles, electricity and many other so-called modern conveniences are rejected. Travel by horse and buggy is the predominate mode of transportation. Owning an auto is not permitted but accepting a ride from neighbors or hiring a driver is permitted and travel to distant locations on busses or trains is permitted by the church because, unlike the car, they may not be used for personal status. One of your first stops when you arrive in Lancaster County should be the Pennsylvania Dutch Visitors Center. Here you will find loads of brochures, maps, local activity schedules, friendly advice, and suggestions of ways to make your stay in these two distinct worlds most enjoyable. Lancaster County has more than 30 family farms that, in addition to regular farming, operate as fine bed and breakfasts. Guests of all ages can get right into the swing of farm living gathering eggs, feeding the chickens, watching the milking and participating in other chores of what life is like “down on the farm.” Some of this can be done before sitting down to a farmhand breakfast of eggs, bacon, freshly-baked breads and fruits. After breakfast, some B&Bs offer hayrides, or you may plop into a hammock with a good book to relax, or go exploring the area. You will find an almost endless array or possibilities of things to attract and interest you. One of the first places you will want to visit is the so-called “miracle mile” stretch along the route 30 corridor which is packed with outlet shopping, Amish attractions, an amusement park for the youngsters—and if you don’t fancy staying at a B&B, this stretch has hotels, motels, and restaurants where you will be in one center of the area’s attractions. In downtown Lancaster you will find a rich heritage of the area in the museums, churches, historic buildings as well as a center for shopping. There are more than 250 boutiques, restaurants, galleries, and entertainment spots. Although you will find Lancaster the center of the county, places throughout the county will attract you. In the northern part of the county you will want to visit Adamstown, known as Antiques Capital U.S.A. Here there are more than 3,000 antique dealers. Here you can find everything from pocket watches and china to the proverbial kitchen sink. And if this isn’t enough to keep you finding what’s new in the old, along the back roads of Lancaster County you will find the Strasburg Antique Market with more than 60 dealers and 70 additional ones between Elizabethtown and Hershey. At Strasburg, break away from antique browsing long enough to visit the museums and toy train extravaganzas. Tour the National Toy Train Museum and for a nostalgia moment take a ride on the Strasburg Rail Road. Here you can explore the engines and rail cars up close. You will see a collection of more than 100 locomotives and railcars, including the Pennsylvania Railroad collection. And while our minds are on Hershey, be sure you plan time to visit this chocolate paradise. Besides seeing your favorite chocolates created, this community offers Hersheypark with looping roller coasters, go-carts, bumper boats, batting cages, and musical shows. But let’s not have so much fun that we forget about the unique shopping. The Amish and Mennonite women create true works of art in their quilts, “quillows,” key chains, aprons, and other treasures to take home to show off to friends and remind you of the happy days of your travels. If there are children in the party, be sure to visit Dutch Wonderland Family Amusement Park. It has rides, shows, shopping, gardens and food. By all means bring along your appetite. Any of the restaurants in the area make you hungry just looking at the menus. Try some schnitz and knepp, shoofly pie, apple dumplings, chicken pot pie with a side of chow chow, dried corn, or whoopee pies. Many of these are recipes passed down from generation to generation with the purpose being not only to tickle the pallet but also to furnish the food to sustain the workers in the fields. As you tour Lancaster County you will be confused about the time—is it the early 21st century or really the late 1600s and early 1700s when the Amish sought out a place to practice religious freedom? This feeling will be even more intense as you take one or more of the many horse and buggy-ride tours of the area. The rolling hillsides of the Pennsylvania Dutch Country will give you moments of contradiction: times of busy, bustling business and swift-paced amusements interspersed with times of traditional, humble, frugal living with the family at the center and neighbor helping neighbor. The Lancaster Airport is six miles north of the city. Rental cars are available. Fees: No landing fee for personal aircraft and no parking fee unless parking near the FBO. Parking fees are often waived if fuel is purchased. Before you make your reservations decide what kind of a trip you want. If you want a restful, leisurely time select one of the more than 80 hotels or motels in the area. Maybe you want the feel of life in Pennsylvania Dutch country and will want to select one of the working farms where you can pitch in and feed the chickens and gather the eggs. There are more than 80 country inns and B&Bs. From the sheer number of facilities in the area it’s easy to see that visitors are not only welcomed but pampered and pleased. You can check rates and book your room and rental car through IFA’s Online Travel Booking Service at www.iflyamerica.org/travelservices.asp. Significant discounts may apply. Notice: This information is current as of September 2009. It is recommended that you contact the numbers, and/or visit the websites above to determine any changes to the information.